Disasters do not stop at borders. That’s why IPA DRAM strongly supports the regional approach in all its components and activities, and encourages the regional cooperation among the partner countries including sharing of knowledge and information. The partner countries already cooperate in the field of disaster preparedness and prevention through exercises, sharing of information and good practices. Taking stock of the already existing cooperation and exchange, IPA DRAM will focus on cross-border and regional risks, ensuring exchange of good practices in the region. 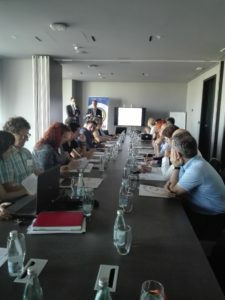 The main objectives of the workshop were to align all participants on the IPA-DRAM objectives, both national and regional ones; to present the final findings and challenges as a result of the fact-finding missions; to share good practices from EU Member States and Partner Countries and to expand the knowledge of the Partner Countries to other applications of Disaster Risk Assessment (DRA) with attention to common data and methods; to consolidate the DRA methodology in relation to the National DRA compilation as requested by the EU CP Mechanism; to clarify the core risk data to be collected and eventually represented in the ERRA.